This is not primarily a political blog, but in times like these ignoring the political situation should not be an option. The first week or so of Donald Trump’s presidency has been worse than I possibly imagined, and my expectations were extremely low. More concerning even than any of the individual policies he has put in place, is the disregard for the rule of law and the constitution. It is also very apparent that our own government here in the UK is not going to do anything to stand up to him, regardless of what he does. 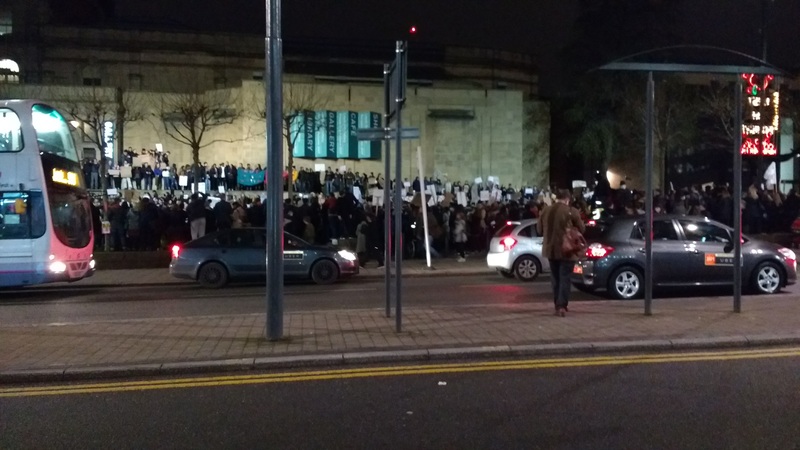 So I joined a few thousand of my fellow citizens at a march in Leeds last night, protesting against Trump’s travel ban, the man himself and our governments craven subservience. I’ve been cynical in the past of marches, protests and petitions, believing there is little chance of them having any impact. I’ve come to realise though that, although protesting has only a tiny chance of making a difference, sitting on my arse doing nothing has absolutely zero chance of making a difference, so I know which I’d rather be doing right now. 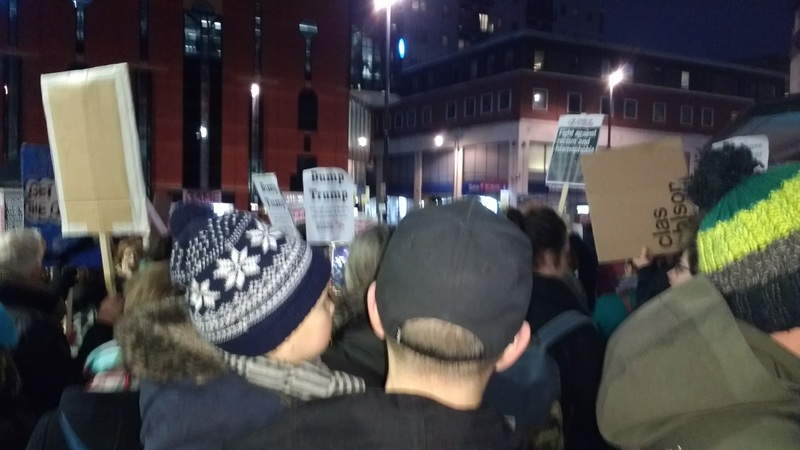 Even so, at the march last night there was part of me which felt bad about being there. Attending meant that I wouldn’t be home in time to see my daughter before bedtime and my heart hurts on days where this happens, so I usually try and avoid it all costs. It’s very easy at times like this to say “my family is the most important thing, I don’t have time to be politically active”, retreat into my home life, and bury my head in the sand. And, of course, my family is the most important thing, but I also have to think about what kind of world I want my daughter to grow up in. The right-wing, isolationist, me-first and screw everyone else direction we seem to be heading in is not the world I want her to know. I will try and find small ways to make the world a better place, and to teach her by example. I doubt I will always succeed in this, but I will try at least. My own mother was very politically active, particularly in the 1980s, when another right-wing government was in power (although Trump may be another level of evil from Thatcher, and I never thought I’d say that). I remember attending protest marches as young boy, not 100% understanding what was going on. I remember watching the TV news and being fascinated by the big, broadsheet newspapers my mum read, full of thousands and thousands of words. It’s because of my mum, I think, that I am politically aware, and I share many of her values. I don’t expect, or want, my daughter to share my exact political opinions, but I hope she too grows to be interested in, and aware of, the wider world around her, and that we share some core values. Although, the most effective way for her to rebel against me, should she wish to, would be to become a Conservative. Back to Trump, and I find myself alternating between despair and hope. Despair at his actions, but hope at the reaction and protest those actions have provoked. I don’t know if there is anything any of us can do to stop him, but I suspect that history, and our children, will judge us poorly if we do not at least try.